The modern attention span is pretty short. Especially when it comes to words. We want an emoji for every feeling and we want our tweets to stay at 140 characters thanks very much. But when you see 'wordy' adverts from only a few decades ago, it really hits home just how much tastes have changed. There we were, flicking through a battered old National Geographic, when we found this little gem from Datsun. We're not saying the writing is bad (although “Thus” is a bit much). But it's the perfect example to demonstrate how copywriting has changed. "To Datsun, building cars to suit their export destination is a responsibility that can't be ignored." Let's face it. This sentence is so stuffy it sounds like something your Uncle Clive would write about his industrial cleaning supplies company. The 1979 approach is practical and logical. Just like your Uncle Clive. 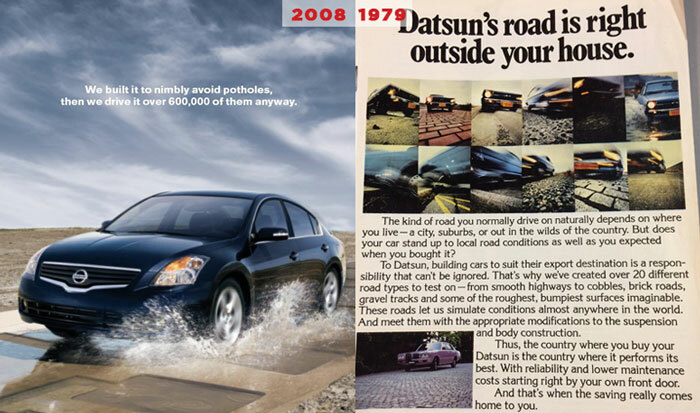 Nissan 2008: “We built it to nimbly avoid potholes. Then we drive it over 600,000 of them anyway." The 2008 writers have got their point across in nine words. It’s the classic trick – big number (5,000 tests) next to a small number (one car). The result is a message that says ‘look at all the good stuff we’ve distilled into this one car’. But is it worth spending all those words describing road types when you can just say “600,000 potholes”? Because if the car can handle 600,000 potholes and 5,000 tests, it can probably handle your weekly trip to The Big Asda. It goes to show, if you’re short on space then a well-placed statistic can speak a thousand words (or two long sentences). 3. Do you really need to say that? In 1979, old Clive is working with quite a few key messages: 1) our cars are customised and tested for each different region, 2) our testing makes them more durable in the real world, 3) this saves you money on repairs. With so many messages, his approach becomes something like a gently persuasive debate you'd have over a pint in the local pub. Naturally, he starts at the very beginning. "The kind of road you normally drive on naturally depends on where you live…”. And as for the ‘durability = saving money’ message, they don’t feel the need to say it because they assume you already know that. It’s a given. Does anybody actually want a new, non-durable car which haemorrhages money? On first impressions, Uncle Clive’s 1979 ad has a lot of information for a reader to take in. But, the newer advert still has a fair number of words (nearly 100). So, perhaps it’s not the word count that makes the Datsun copy tough to absorb – it’s the way the sentences are constructed. "Thus, the country where you buy your Datsun is the country where it performs its best. With reliability and lower maintenance costs starting right by your own front door." Almost all sentences in the 1979 ad contain 10 or more words. Some have more than 20. By contrast, Nissan 2008 like to break things up. Why? Because apparently it doesn’t matter how literate people are, they just don’t want to read lots of long sentences. 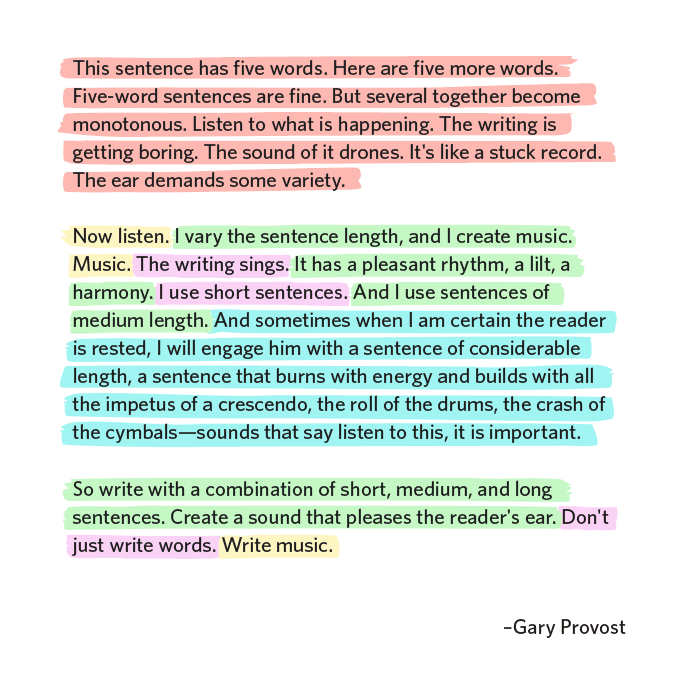 But the 2008 ad doesn’t only use shorter sentences throughout, it mixes up the sentence length to create flow, à la Gary Provost’s ‘This sentence has five words’. Interestingly, the 2008 advert makes no attempt to engage readers. There’s no mention of “you” in that copy. No questions. Their message is very much ‘We’re amazing’. With the subtext of ‘Buy our awesome car if you want. We don’t care’. In contrast, the 1979 ad is much more ‘We care. Look at what we can do for you’. It asks the reader a question, and uses “you” or “your” a total of nine times throughout. It’s a great technique for making copy feel warmer and more personal. But is it how you'd sell a car these days? Perhaps the lack of "you" in 2008 is a symptom of modern attitudes – specifically those of aspirational consumers who want a car that seems just a little out of their reach. In a world of fast ads with fast words selling fast cars, I think we've developed a bit of a soft spot for Uncle Clive’s gentle chat-in-a-pub approach. Especially if he pays for the pints.